You can organize your library of documents easily using all the features that we provide for that. With you library organized your only task will be read and work with your documents. Take annotating to a new level! Highlight, circle, underline or strikethrough texts. Read and write notes directly onto the document. 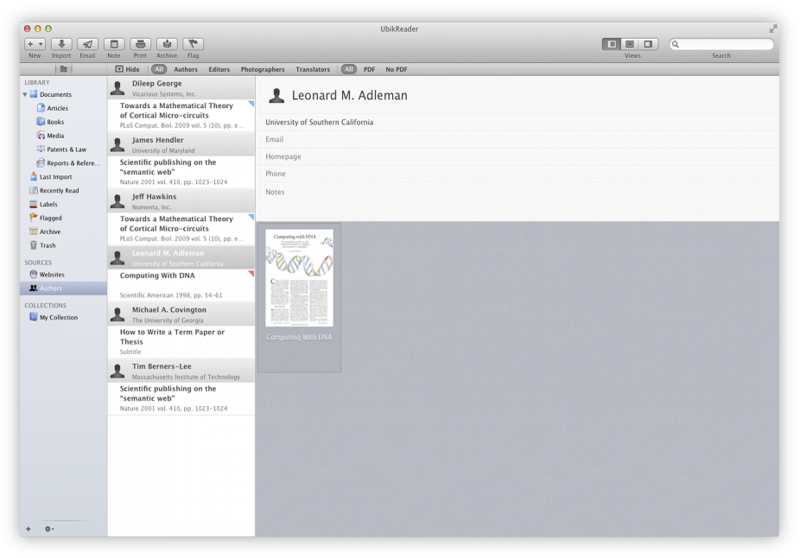 You can organize your library of documents by easily creating Collections or Smart Collections. Apply flags, labels, rate and classify your documents then allocate them using preset types and subtype categories. 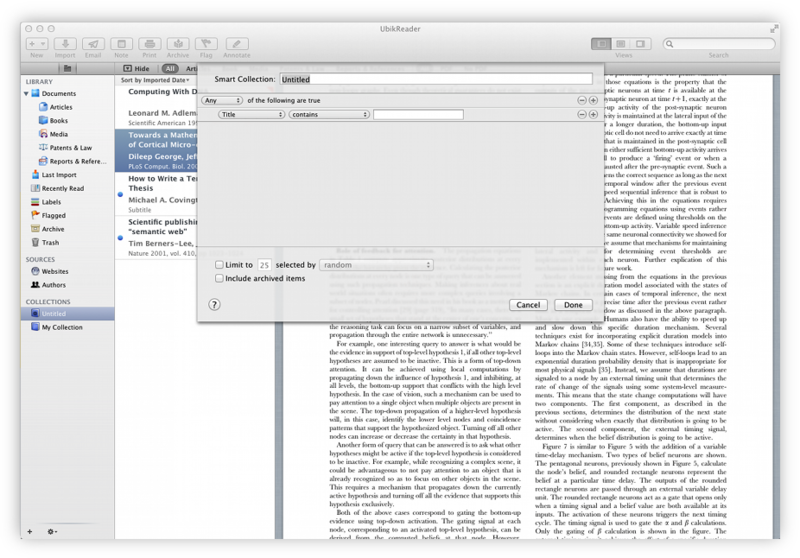 Smart Collection allow you to organize your documents quickly by using keywords, authors, dates, and others fields. 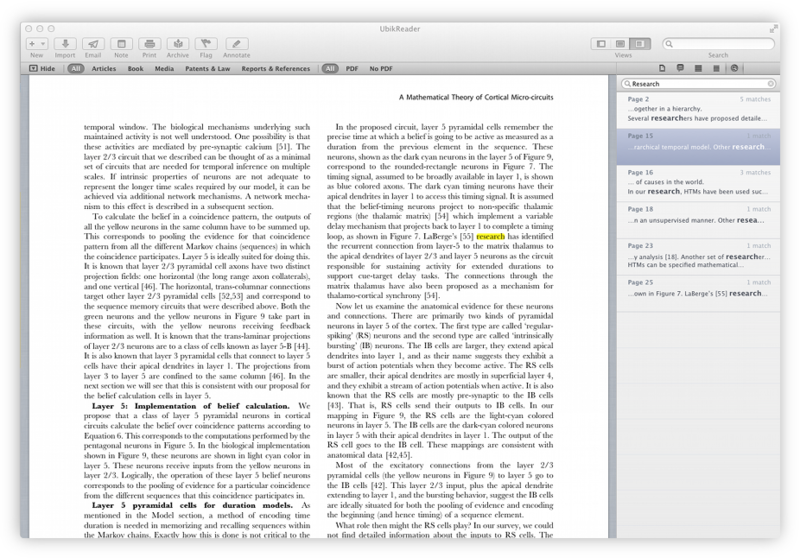 In the Authors section you will can browser around your documents grouped by author name. Also you can set some metadata of each author, that allow you to more rich Library. 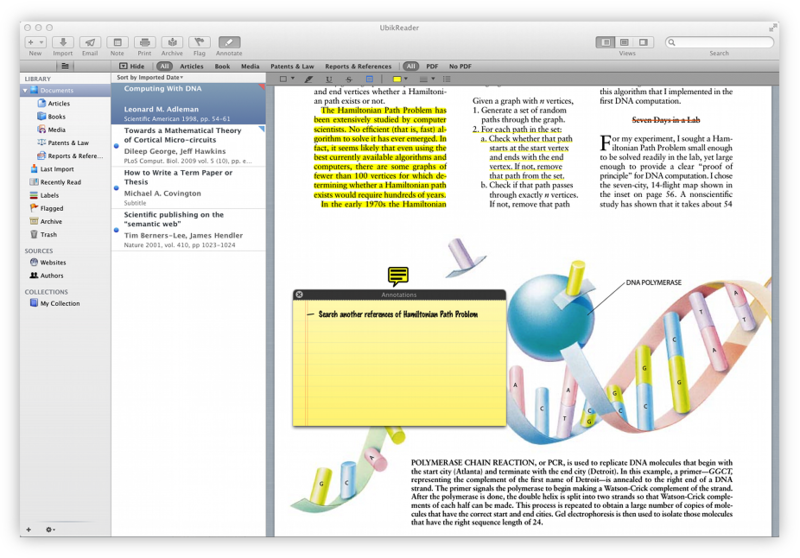 This application, UbikReader Pro, is an essential tool to any students or researchers. Search within the content of your document or find them by searching words, authors or titles you have associated to them. 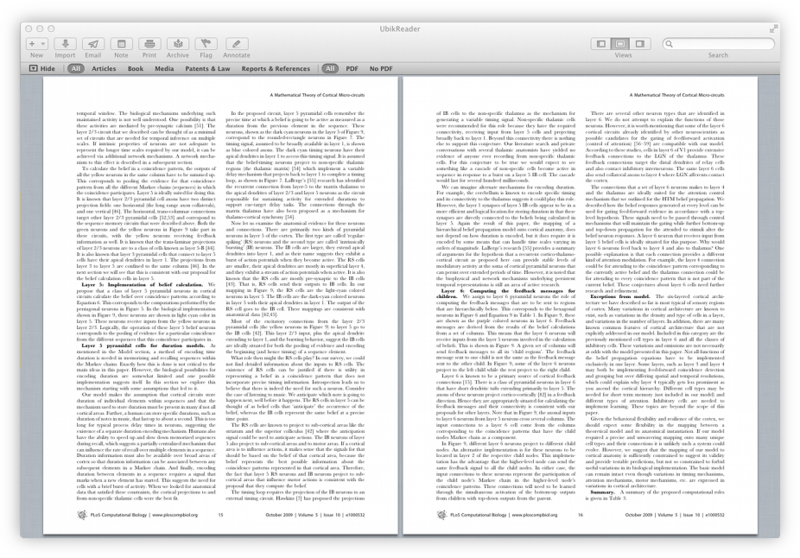 You can enjoy reading your documents in full screen mode. You can change the layout of your documents to your preference using one or two columns and the continuous or page by page mode. You can import new documents easily from diferent ways, using the import menu, drag & drop in any place of the application or using one of the plugin for import documents from the browser. You can also import website. Today, blog, magazine, newspapers, journals, publish most of its items on internet. 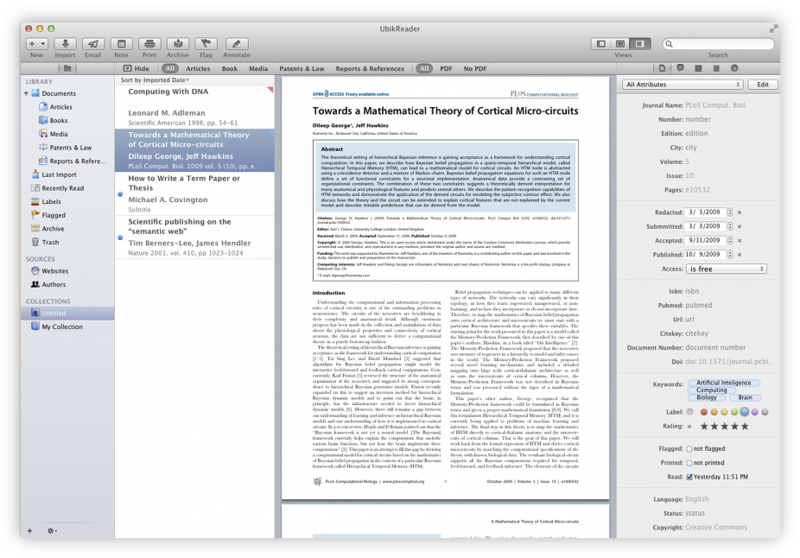 You can organize your documents library easily create "Collections","Smart Collections", using keywords to categorize your documents, or through the authors of the documents. We provide a powerful interface to move your document through one collection to another. We provide two diferent type of Collections, "Normal Collection" where you can move the document you wants and "Smart Collection" where you only setup a term to search and the app automatically search all document asociate with that term search. Another way to have your document well organize is using keywords, you can add all keyowords that you want to document that determine the subject. Then you can browse through all your keywords and thus access all related documents. With this app you could have perfectly organize your documents but this is not usefull without a powerful interface, and how we know it we provide a exciting interface to read your documents. You can read its perfectly on portrait or landscape, make zoom out or zoom in to see with more details some parts of your document. You can easily turn pages by swiping your fingers, make a quick navigation to the desired page and you will continue reading where you left off the previous day. You can take notes at any time from any page, and then access it quicly in the future. 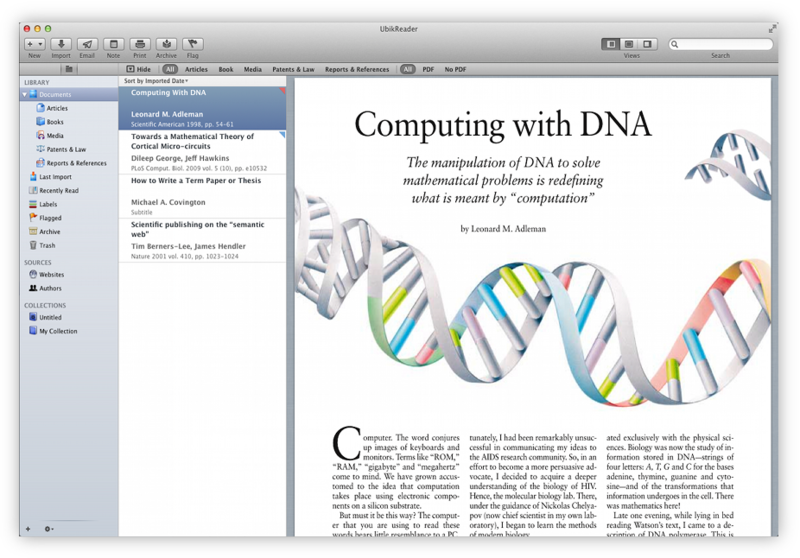 Bookmarks is another way to associate text to a document, you can anotate anything you want to the current page of a documents that you are reading and in the future will access it quickly without complications. Anytime you have the option to search your documents easily by simply entering text associated with the document. You do not have to preocupate about create complicated search filters, only write the text you are want to search. You can associate to each document information relating to publication, facilitating their clasificacción and subsequent search and use. You can create profiles of authors, where you can fast track their work, and you always have the contact information. You can import your entire library of documents easily from the iTunes application, simply by Drag & Drop. If you are browsing in Safari or you are received a pdf by Mail, you can easily import to Ubik Reader with 1-Click chosing "Open in" button. Dropbox allows you to sync your files online and across your computers automatically. Now you can enjoy all your documents stored on Dropbox easily from your iPad.